Join us for two exciting events on Haiti, organized by the Solid’Ayiti collective as part of Social Justice Days 2012 via the Quebec Public Interest Research Group (QPIRG) at McGill University. feat. performances by Doc Filah direct from Port-au-Prince, Haiti and Paul Cargnello/Karma Atchykah duo. Join us for the third edition of Artists for Haiti, a collaboration with Social Justice Days organized by the Quebec Public Interest Research Group (QPIRG) at McGill University. 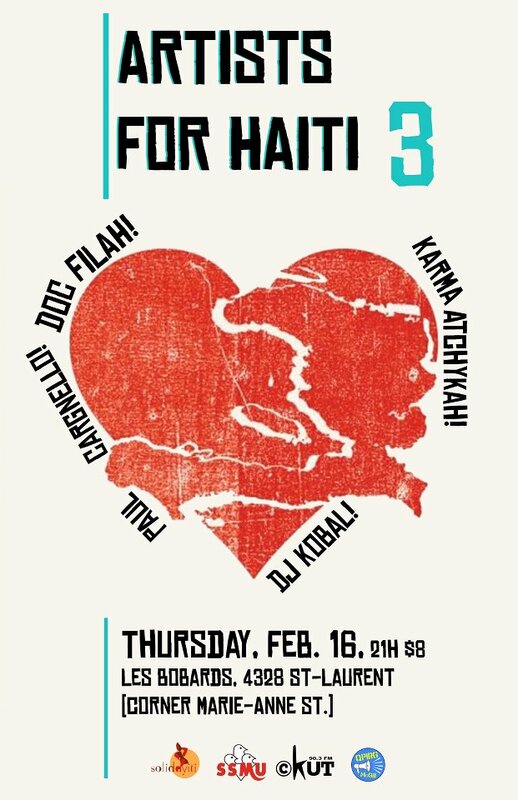 A special concert featuring celebrated Rap Kreyòl artist and activist Doc Filah direct from Port-au-Prince, Haiti. Doc Filah, born in 1976 as Pierre Harry Dumorney, is a celebrated voice in Haitian hip-hop, a politically sharp solo artist and member of the popular Rap Kreyòl ensemble Majik Click. Filah is a doctor specializing in veterinary medicine, a graduate from the University of Havana, Cuba. Today, Filah works in Port-au-Prince while teaching at Universite Americaine des Sciences Modernes d’Haiti (UNASMOH). A past UN consultant with the United Nations Food and Agriculture Organization, Filah has spoken out on the UN’s role in a cholera epidemic that has killed thousands of people in Haiti. He has also criticized the international aid complex in Haiti for its lack of accountability to the Haitian people. As a hip-hop artist Filah launched the celebrated track REVELASYON in 2004 in collaboration with the NGO Yele Ayiti. Filah has also collaborated with Haitian hip-hop artists Barikad Crew, Fantom, Lòlò, BIC and remains a key member of Majik Click. When Karma Atchykah and Paul Cargnello take to the stage two worlds collide: Punk-Rock & Hip-Hop. Keep your ears, hearts, and minds open because they will be pointing the next wave of revolutionary rock straight at you. Organized by the Solid’Ayiti collective in collaboration with the Quebec Public Interest Research Group (QPIRG) at McGill University. 2) Haiti: struggles for access to public health and education today. SolidAyiti presents a panel exploring current struggles in Haiti for access to public health and education today, as part of Social Justice Days organized by QPIRG McGill. Francisco Delacruz is from Lospalis, Haiti located in the Central Plateau and is the founder of COSADH an NGO focused on coordinating PUBLIC health and development services in the central plateau. Francisco is a doctor and graduated from the National Autonomous University of Mexico and also studied public health system management in France. Today Senator Francisco representing the citizens of the Central Plateau. Isabel Macdonald will present on the topic “New Haiti, Same Corporate Interests?” two years after Canada and other powerful governments announced announced bold plans to build a “New Haiti” after the January 12, 2010 earthquake, journalist Isabel Macdonald looks at who’s benefiting from Haiti’s rebuilding. Her talk focuses on the problems that have plagued these reconstruction efforts–from delays in funding, to the exclusion of Haitians from decision-making, to the over-reliance on imported goods, to the awarding of no-bid contracts to foreign companies. Isabel Macdonald is a Montreal-based journalist and media scholar who writes for The Nation, The Montreal Gazette, The Toronto Star and The Guardian, amongst other publications. A contributor to the Canadian Center for Investigative Reporting, her investigative reporting work has been featured on BBC World Service, Good Morning America, MSNBC, Radio-Canada’s Telejournal and CNN, and she has often appeared as a guest on Democracy Now! The former communications director of the NYC-based media watch group FAIR, she is currently completing a PhD in Communication at Concordia University analysing the prospects of new forms of digital storytelling–including “comics journalism”–to address the democratic deficit in Canadian reporting on Haiti. Organized by Solid’Ayiti collective as part of Social Justice Days, co-organized by the Quebec Public Interest Research Group (QPIRG) at McGill University.